President Obama on Friday announced that all U.S. troops will withdraw from Iraq by the end of the year. “After nine years, America’s war in Iraq will be over,” Obama said. And our involvement in Libya will end October 31. Funny how all the tea types are whining and complaining about Obama finally getting us out of Iraq. Seems they are the ones who think we are spending too much money. No more Iraq and no more Libya will, as Obama puts it, allow us to finally do some "nation building here at home". Once we have no more involvement in Afghanistan, then we can really get down to the business of making our country better and stronger. I'm confident Obama will continue to process of getting us out of that quagmire. 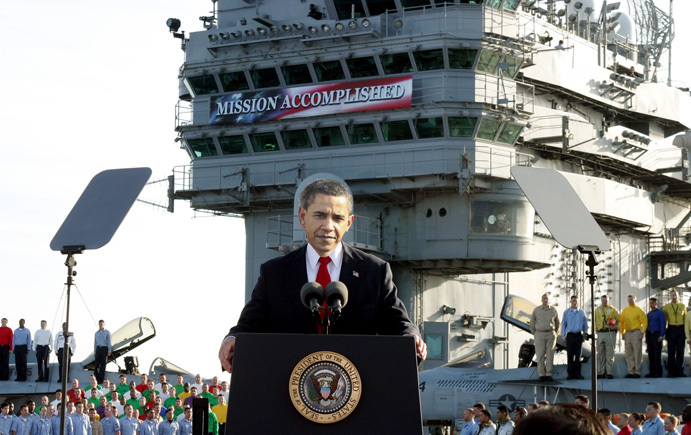 Ending the Iraq war is a good thing, no matter what negative spin the GOP puts on it. They're just jealous, and ticked off that this will give Obama a bump in the polls.